It was a historic day for The Master’s College, as TMC’s running program hosted their first home cross country meet in over a decade at Central Park in Santa Clarita. The inaugural Mustang Challenge Cross Country Invitational was a tremendous success, thanks to overwhelming support from The Master’s College family, friends, the City of Santa Clarita, and the local community. An army of over 50 volunteers comprised of TMC administration, faculty, staff, alumni and students, along with the help of city employees and many local fans, worked together to put on what TMC hopes will be an annual event for years to come. The women’s 5000m race began at 8:15 AM. Six of the 10 teams in attendance were GSAC member schools, with Loyola Marymount University, University of La Verne, College of the Canyons, and former GSAC member, Fresno Pacific, rounding out the field. Looking stronger than just two weeks ago at the UC Irvine Invitational, the Lady Mustangs put together what was perhaps the best team performance in the history of The Master’s College. Close behind Kellerman was teammate, and local Saugus High School standout, freshman Karis Frankian (Saugus, CA), finishing 3rd overall with a time of 18:07; another strong performance from the newcomer. Coach Schroeder expects Kellerman and Frankian to continue to progress together throughout the remainder of the season, and believes they have a very good chance of going #1-2 at the GSAC Championships coming up November 3rd. TMC junior Katrina Graham (Riverside, CA) finished 10th overall in 18:46; also a personal best. Coach Schroeder was excited to see Graham with such a strong finish among a field of largely GSAC competition. 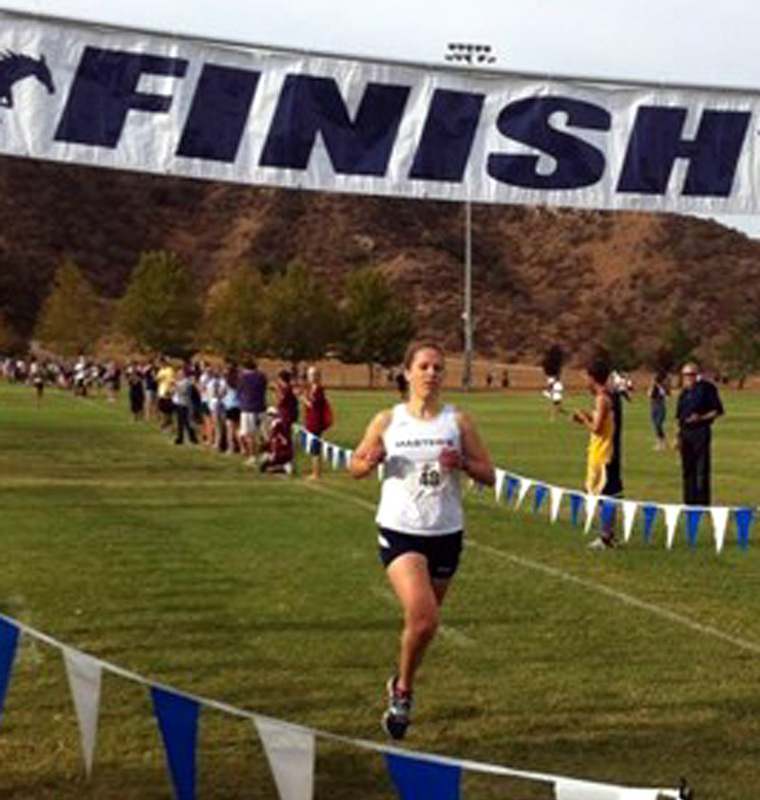 Graham’s finish today bodes well for her claiming an All GSAC spot at the Championship meet. Completing the score for the Mustangs were juniors Micayla Frankian (19:33) and Hayley Parkinson (19:49). Micayla also put together a personal best today, and along with Parkinson, promises to continue to move up throughout the season. In spite of great performances, the Lady Mustangs were bested by Westmont College. Westmont won the meet, with the Mustangs finishing just 11 points back in second place. Although they would have liked to finish 1st, it was a special day with Kellerman claiming a victory on TMC’s new home course, and three members of the TMC squad finishing in the top ten before excited crowd of spectators. The Master’s College women’s cross country team competes next at the prestigious Stanford Invitational in Palo Alto, CA on September 29th. On behalf of the Mustangs, a warm thank you to all TMC administration, faculty, staff, alumni and students, as well as local supporters for making the inaugural running of the Mustang Challenge a spectacular event.